Vital Baby Nurture healthcare accessories are safe and easy to use for all the family. The Vital Baby Nurture Health & Safety Kit contains a Digital Room & Bath Thermometer which has been specially designed to give fast and accurate temperature readings whether it is sitting in baby’s room or floating in their bath. 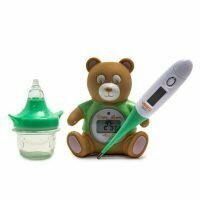 Vital Baby’s Nurture Health & Safety Kit also contains the rapid alert baby thermometer which has been designed to be safe and easy to use and its built-in memory function helps keep track of baby’s body temperature changes over the course of a day. The Vital Baby Nurture Health & Safety Kit is completed with the nasal decongester for babies, which clears blocked noses quickly and effectively with a gentle squeeze and is perfectly sized for little nostrils. All products in the kit are suitable from newborn.